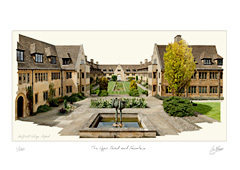 Nuffield College was founded in 1937 and was originally funded by William Morris, Lord Nuffield. The original plan for the college to occupy land on both sides of Worcester Street was scaled down and the College buildings were designed by Austen Harrison. 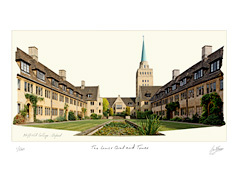 His plans were approved in 1940 but the College was not built until the mid 1950s. Despite being one of the newest and smallest of the colleges, its architecture follows the traditional college quad layout. The modernistic spire, which is a landmark for those approaching Oxford from the west, tops a masonry-clad steel-framed book-stack housing the college library.